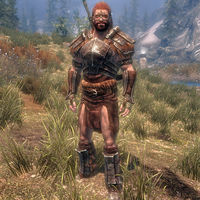 Hakon One-Eye, a Nord warrior, is an ancient hero currently residing in the Hall of Valor in Sovngarde. He was one of the warriors, along with Gormlaith Golden-Hilt and Felldir the Old, who fought against Alduin, ultimately sending him forward through time using an Elder Scroll. He and his compatriots later assist you in the final battle against Alduin in Sovngarde. He wears a set of ancient Nord armor with matching boots and gauntlets. He wields an ancient Nord battle axe. He knows the following dragon shouts: Disarm, Dragonrend, Frost Breath, Unrelenting Force, Whirlwind Sprint, along with the greater power Battle Cry. Upon returning to Tamriel, his spirit can be summoned using all three words of the Call of Valor shout. When summoned, he may tell you, "Lead me into battle." or "What is your need, Dragonborn?" while in battle, he may taunt, "I shall sing of thee in Sovngarde! ", "Feel the bite of my axe! ", or "It is glorious to battle once again in Tamriel!" and only use the Unrelenting Force and Disarm shouts. Dragonslayer: Put an end to the World-Eater. He is voiced by Paul Ganus when in Sovngarde, but due to an oversight he uses the MaleGuard voicetype when in Tamriel. Hakon that appears during the quest Alduin's Bane: BaseID 000CDA01, RefID 0004423D. Hakon that you can summon: BaseID 000923FB (a different RefID is assigned each time he is summoned). This page was last modified on 15 November 2018, at 20:52.